Following on from our brunch at the Wildflower Cafe and our tour round Portobello Road, I’d like to share with you a couple of other eating places that our daughter Mlle took us to during our few days in London. It certainly pays to know a local in a place as large as the metropolis and since Monsieur Le Chic and I haven’t lived there for nearly 25 years now, we appreciated Mlle’s insights! First stop an independent cafe with an Aussie twist – Beany Green in north west London. Mlle and I had a quick morning coffee/tea break one Sunday morning at the Beany Green Little Venice/Paddington Central branch (they have set up a few branches around London now and you can find out all the details here). It is Aussie owned with an emphasis on healthy eating. Just to allay any doubts, everything we had from the banana bread to the raw coconut balls tasted delicious. We only breezed in for a quick snack as Mlle was on her way to work (unfortunately we had left Monsieur Le Chic languishing back at the hotel stricken with the flu). The website promotes the Aussie connection, come to Beany Green to hear, “familiar Aussie accents” and it has certainly become one of Mlle’s go-to London eateries. Everyone is assured of a friendly welcome though, not just those from the Antipodes! 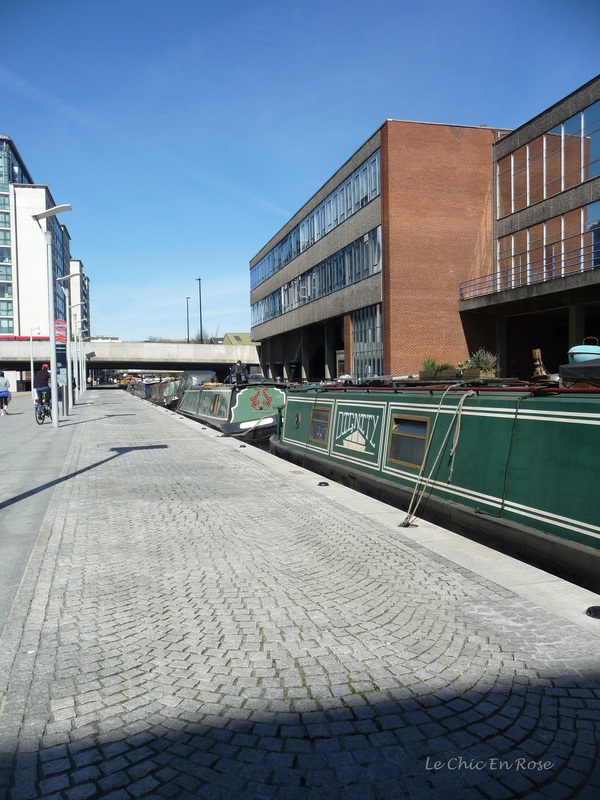 The Little Venice branch is a stone’s throw from Paddington Station and Underground – you just follow the footpath along the canal. Pot of herbal tea Beany Green – our table number was on a bunch of plastic bananas! Our little spot in the window watching the world go by – Beany Green Cafe Little Venice. Westway in the background! We had a quick walk along the adjacent Regent’s Canal before Mlle had to leave for work. If you are looking for a cafe with fresh, wholesome produce in a funky arty setting, give Beany Green a go! The pathway along Regent’s Canal Little Venice. Beany Green is just a little further along from where this photo was taken on the left! A couple of nights later with Monsieur on the mend we went to one of Mlle’s favouite restaurants and bars in the heart of Soho – Cafe Boheme. As its name would suggest, Cafe Boheme is a “traditional French cafe in the heart of the West End’s creative district”. We were lucky to get the last available table as we hadn’t got a booking (note booking is strongly advised!). You really feel as if you’re walking into a traditional French bistro when you step inside – you could well be in France. The furniture is dark and moody, the lights dimmed with burgundy lamp shades and the paint the sort of pale mocha/honey coloured hue that I remember so well from previous trips to France. Please excuse the quality of the photos – it was not easy at night to get good photos in the dusky light. Cafe Boheme specialises in authentic French food with such classics as Soupe de Poisson (fish soup) and Escargots (snails!) on the menu. They also offer their Plats du Jour (daily specials), which are highly recommended. Here is the menu in more detail complete with light reflections! Since by now I was coming down with the flu and not feeling overly hungry we opted to share a selection of dishes including the charcuterie platter, the haricots verts (green beans), cheeses and salads. Monsieur, who fortuitously had his appetite back, ordered the Toulouse sausage with frites (chips). Naturally in French style we ordered a fine bottle of red wine (Le Versant Pinot Noir Pays D’Or 2013) to accompany the food. Le Chic En Rose at Cafe Boheme feeling the worse for wear from the flu not the wine! Fortunately I did feel up to dessert – we had a mouth-watering selection of sorbets and macaroons with coffees and tea (for me) and Monsieur tried out the calvados (apple brandy from Normandy). 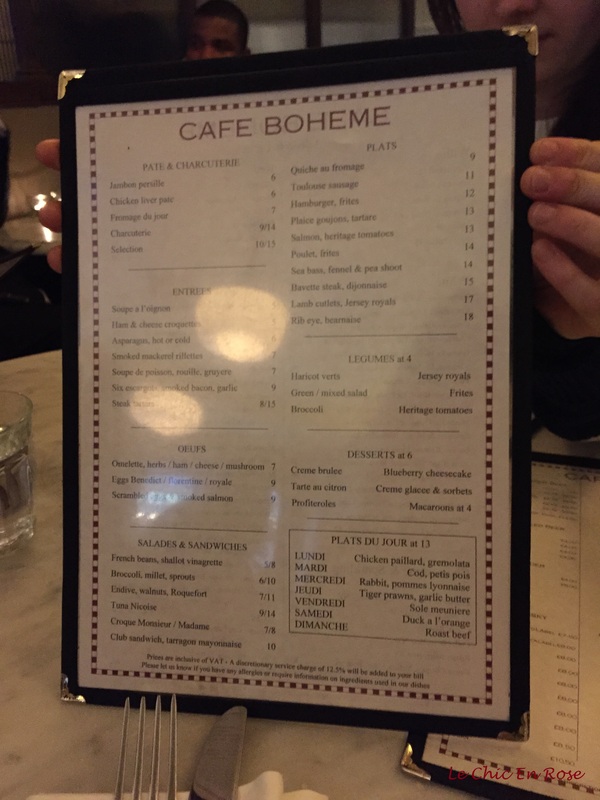 Cafe Boheme is an authentic French experience in the heart of the capital and is highly recommended! 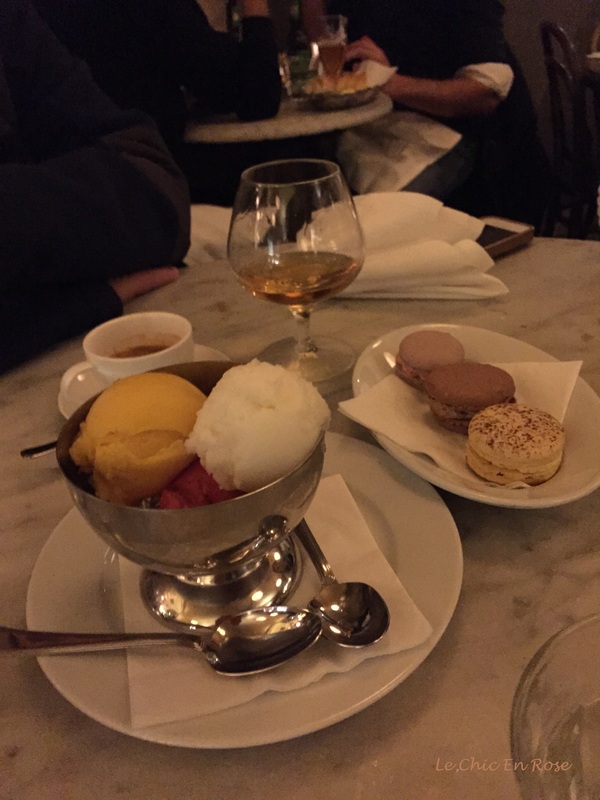 Macaroons and sorbets followed by coffee and calvados – desserts at Cafe Boheme! Finally I had to give a mention to Covent Garden – somewhere I always head back to whenever I’m in London. Mlle did not need to guide me here – I already knew it well and have always loved the little cafes and restaurants in the Piazza area. Yes, it is crowded and touristy but you can often find a seat just when you need it and this is what happened to us when we popped into Chez Antoinette late one afternoon in search of a good cup of tea. Styled as a “tartinerie”, Chez Antoinette is a charming French cafe in the basement area of Covent Garden just opposite the Punch and Judy pub (another of our favourite haunts). A “tartine” is a sort of posh French open sandwich and the owner of Chez Antoinette, Aurelia Delclos, who comes originally from Lyon, has based her recipes on those used by her maternal grandmother (the original Antoinette and inspiration for the cafe). We only wanted a cup of tea, which was no problem (we were there around 5pm) so I can’t tell you any more about the tartines there but they do sound delicious (see here for more of Chez Antoinette’s story). However we were able to enjoy afternoon tea served on some items from the extensive collection of antique china that Aurelia has collected over the years. It was a charming and delightful interlude and we’ll go back one day to sample the tartines themselves! You can find further information about cafes and restaurants in the Covent Garden area here. Au revoir and “bon weekend”! Love the sound of all of these places Rosemary. We always head to Covent Garden when we’re in London and I like the sound of those tartines. The French restaurant in Soho sounds great too, definitely another one to try as we usually find ourselves in that area too. 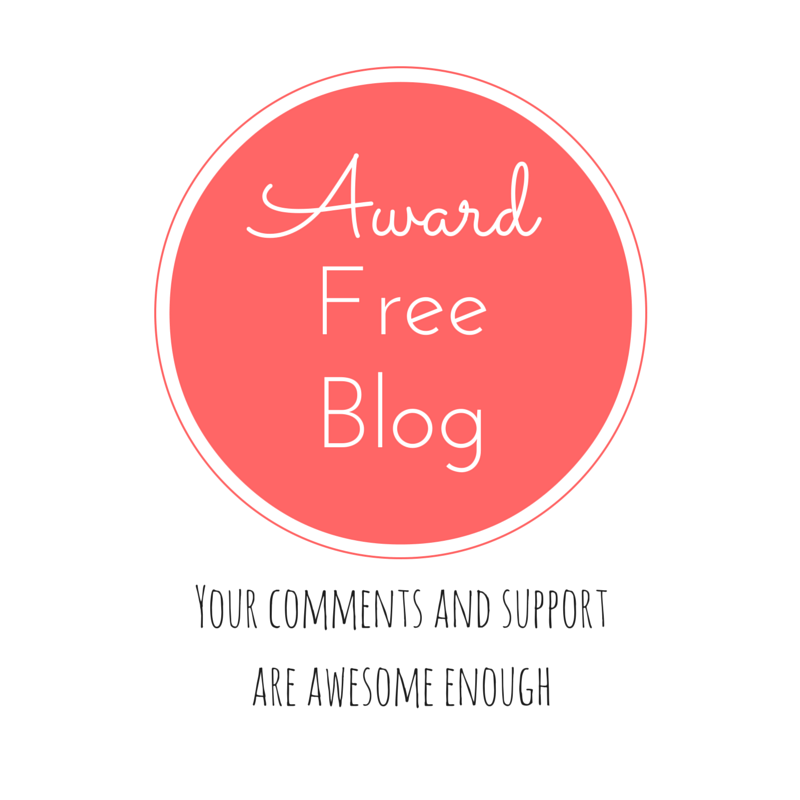 Clicked through to the Beany Green website as well – right up my street!! Thanks for all these great suggestions, they’re all going on my list. Bon weekend to you too!! I think it might rain here too Rosemary – we don’t need it so much though!! Still, at least it’s the weekend!! Wonderful! I would love to visit Cafe Boheme! It all looked *so* delicious! And, we stayed in the Covent Garden area… I would have loved to have a cup of tea at this quaint spot. It’s the one experience missing from my quick one-day trip to London. Thanks for sharing your discoveries! I’m heading to London next week for work. Thanks for giving us some ideas for dinner! Oh poor Monsieur got flu again? Glad he’s on the mend. Cafe Boheme is also one of my favourite haunts in Soho – one of many! But I used to go there a lot catching up with fiends as my office was in Soho. Lovely to see you had a good time and the food is delicious! Mouthwatering! One to remember next time I visit London. 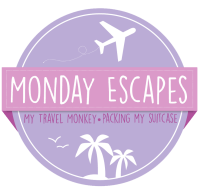 So happy to have you once again on #MondayEscapes! So many wonderful tips for London! I have to save this because I might be going there soon! Awnn, I hope you both come back someday.. there are still many things to do and try around here! I hope it does, it’s been a while since I last visited London. Oh the weather today has been horrible, we had to change our plan a little. We went to the Pannal Car Boot Sale in the morning, and found two nice pots. It came from Australia. It was from lady who has lived there for a while. Then we drove to Harrogate and went to Valley Garden first. We had a close look at all the flowers displays, it was so gorgeous and well maintained. We brought a picnic with us, so we ate in the park. After lunch, we were ready to go to Harlow Carr, but it has started raining… so we decided to go home and explore this garden another time 😦 The weather looks bad for the whole week, it is disappointing ! I will ! Thank you ! London is such a nice city and i love all the cute little cafes and eateries. The French cafe looks really nice and very French.